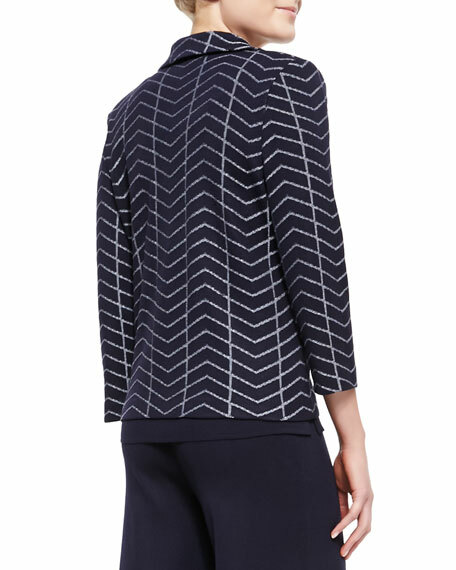 Misook spider web designed knit jacket. Approx. 24 3/4"L from shoulder to hem. Caroline Rose "Sitting Pretty" jacket in floral jacquard. Spread collar; open front. Bracelet sleeves. A-line silhouette. Straight hem. Polyester/silk/polyester metallic. Caroline Rose "Sitting Pretty" jacket in floral jacquard. Spread collar; open front. Bracelet sleeves. A-line silhouette. Straight hem. Polyester/silk/polyester metallic. Polyester lining. Dry clean. Made in USA of imported material. Model's measurements: Height 5'10"/177cm, bust 33"/84cm, waist 25.6"/65.2cm, hips 35.8"/91cm, dress size US 2-4/FR 34-36. DL1961 Premium Denim "Beekman" military jacket in camo-print. Round collar; zip front with button placket. Long sleeves. Chest flap pockets. DL1961 Premium Denim "Beekman" military jacket in camo-print. Round collar; zip front with button placket. Long sleeves. Chest flap pockets. Flap pockets at hips. Cinched waist. Relaxed fit. Cotton/Tencel® lyocell. Imported. Model's measurements: Height 5'10"/177cm, bust 33"/84cm, waist 25.6"/65.2cm, hips 35.8"/91cm, dress size US 2-4/FR 34-36. Eileen Fisher short, kimono-style jacket. Surplice V neckline; open front. Bracelet sleeves. Self-tie sash at waist. Straight hem. Organic cotton. 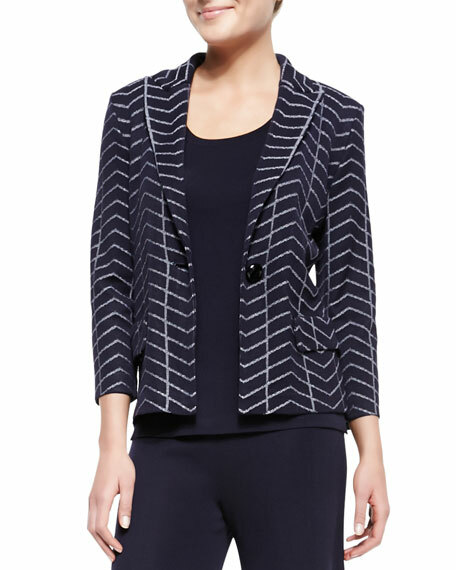 Eileen Fisher short, kimono-style jacket. Surplice V neckline; open front. Bracelet sleeves. Self-tie sash at waist. Straight hem. Organic cotton. Hand wash. Imported. Model's measurements: Height 5'10"/177cm, bust 33"/84cm, waist 25.6"/65.2cm, hips 35.8"/91cm, dress size US 2-4/FR 34-36.